The Almighty has done great things for me, he has exalted the lowly. This great feast is a twin to the Feast of the Ascension of the Lord. Then, if you recall, the preface of the Mass contained these words: Christ is the beginning, the head of the Church; where he has gone, we hope to follow. Today we celebrate the first of us to do just that, as we remember Mary following our Lord into heaven. She is the first to follow him - but not the last: this feast should help open our eyes to our final destination, heaven. So this feast pushes us right back to Easter, to thoughts of death and resurrection: it is the second reading which underlines all this. It talks of the gradual resurrection of the dead: Christ first, then those who belong to him. Of these, the first is Mary, she who was without stain of original sin, she who was most blessed of all women. In her, today, we see the fulfilment of the vision of the first reading: the end of death and the victory of life in Christ. In the book of the Apocalypse, this vision of Saint John shows the woman (who represents the whole of the people of Israel) giving birth to the Messiah. This woman, of course, is Mary, the daughter of Israel and mother of God. She is also the mother and model of the Church, Gods holy people. In reading this vision, dont be daunted by it: read it as a story to be told. It begins with a certain formality, as we see in the words now a great sign appeared in heaven... As you continue, the drama of the vision will come over quite easily. Save something for the last three lines, which is a triumphant conclusion offering an interpretation of the whole vision: it is about the victory over death that Christ has won. This is our reason for celebrating today - that not just Christ, but all those who belong to him, might share in this victory. Second Reading: 1 Corinthians 15:20-26. Take time and care with this reading: it explains the feast we celebrate today. We begin with the resurrection - a very clear statement: it is important to underline the words first-fruits. The next point reiterates that as death comes to all because of Adam, so resurrection comes to all because of Christ. Todays feast finds an echo in the words but all of them in their proper order - Mary is, fittingly, the first. The conclusion of the reading, which looks forward to the end of time, underlines out hope that we too will be among those who belong to him - that when Christ comes we too will share in the eternal life he has won, as we too rise from the dead and join Christ and Mary, body and soul in the joys of heaven. This is a two-sided A4 Mass Sheet, which when folded lengthways will give you a thin booklet. Please feel free to download this pdf file and print it out for Parish use. 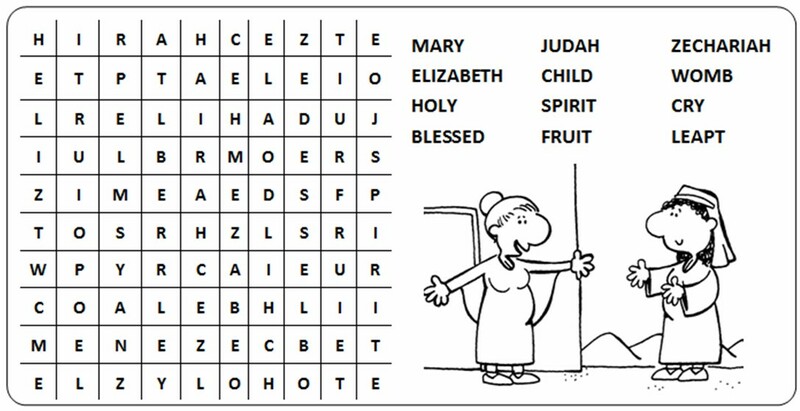 Click on the link to get this Sunday Wordsearch. Feel free to copy and paste it into your parish publications. by reason of their baptism."